‍ HOW WE’RE DIFFERENT: OUR DEVICE IS SIMPLE – lots of sous vide machines require buggy technology just to work fully. Ours is easy – no fighting with the internet. No Wifi or Bluetooth needed. Functions intuitively, right out of the box. 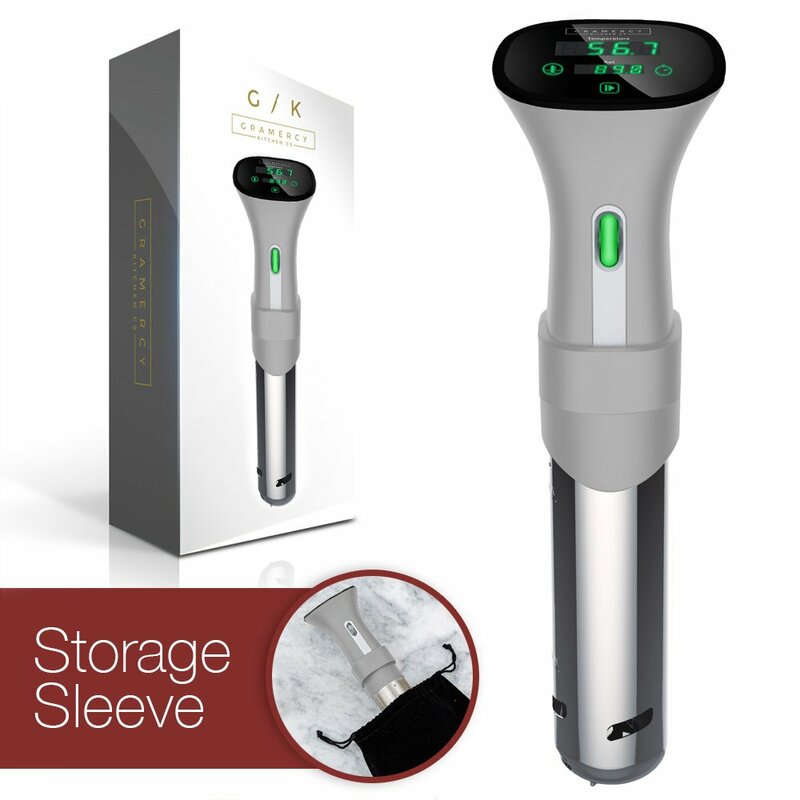 WE INCLUDE A BEAUTIFUL, HIGH-QUALITY STORAGE SLEEVE – no need to scratch your device during storage or have to wrap your expensive sous vide machine in a towel. ‍ CUSTOMER CARE PROMISE: Gramercy Kitchen Co. strives to create complete customer satisfaction, period. Our customers mean more to us than our sales. If you are unhappy with your sous vide pod for any reason, we will replace or refund your order. Zero questions asked. We also love to help out by recommending recipes, answering questions and being a help as you use our device to make the best imaginable food. So please don’t hesitate to reach out – we love to help! ‍ BONUSES! With your purchase you will receive a downloadable time and temperature guide to get you started on your culinary journey! 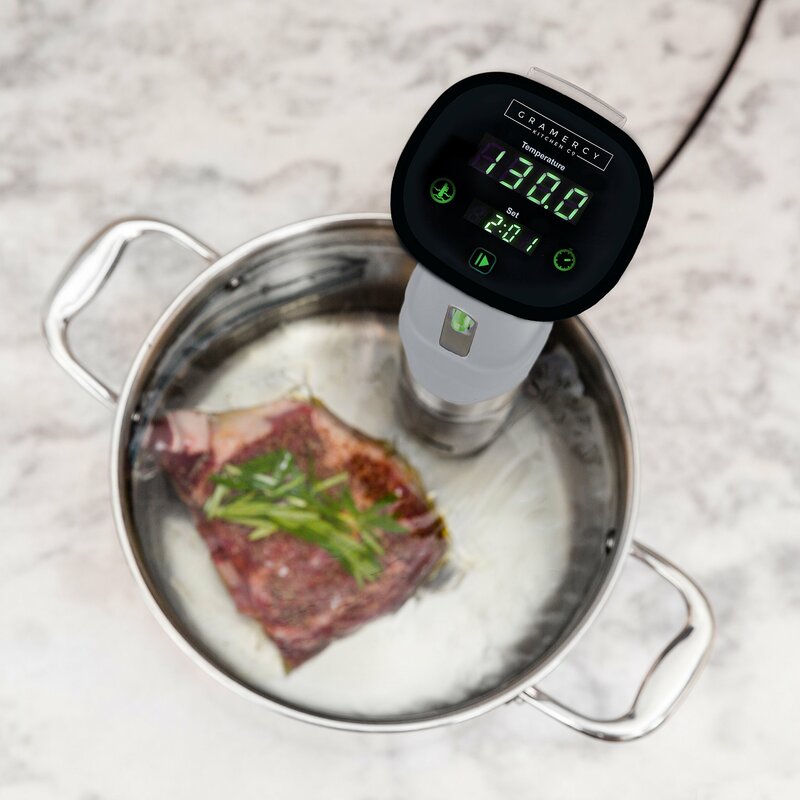 Sous vide is as much an art form as a science, and our guide will help you understand all the important nuances of cooking up the exact dinner of your dreams. Additionally, we are building a growing library of some of the best sous vide recipes around – and you’ll get free online access with your purchase. Make sure to watch your inbox! 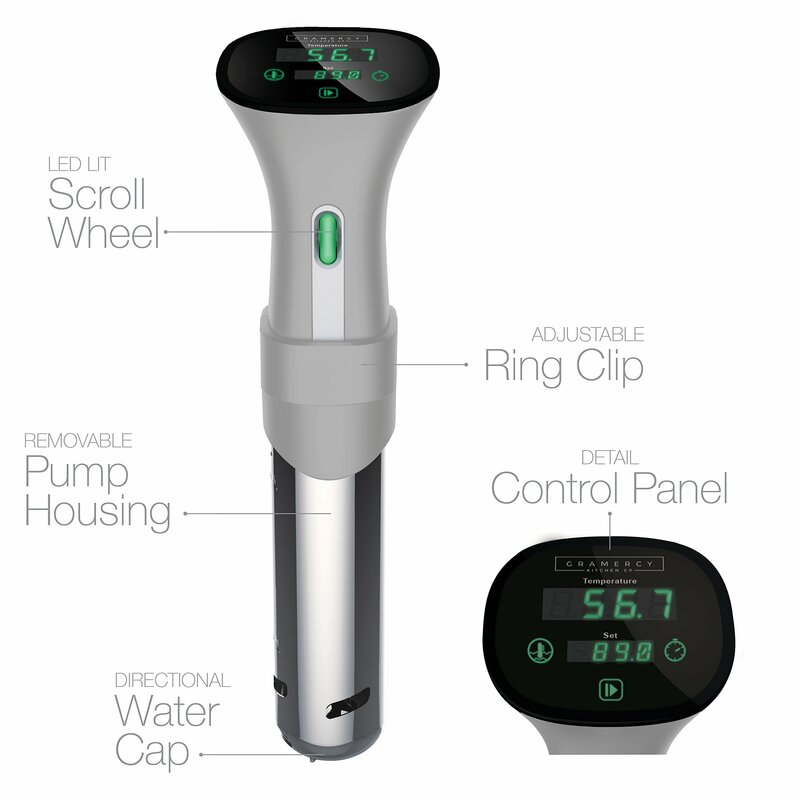 The Gramercy Kitchen Co sous vide immersion circulator: the slow cooker of the 21st century. GOURMET RESULTS AT HOME A secret of the best chefs all over the world, sous vide cooking is coming into its own. Who knew that cooking your food in a precisely controlled water bath could yield such amazing results. Tender, buttery, perfectly cooked food. HANDS FREE COOKING You’re busy – we get it. But are you tired of so-so week night meals? With our machine, you’ll enjoy almost no active cooking time. It takes 10 minutes to get everything set up. Then at the end, you can sear the meat if you want. That’s it. The device does the rest. Spend the rest of your evening with people you love, or hanging out relaxing… You get to choose. PERFECTLY COOKED FOOD Have you ever set out to grill a steak only to have to babysit it, poking it, wondering if it’s done? Or, worse, you realize you passed that 3 minute window of perfection and you’ve already got tough, rubbery meat? 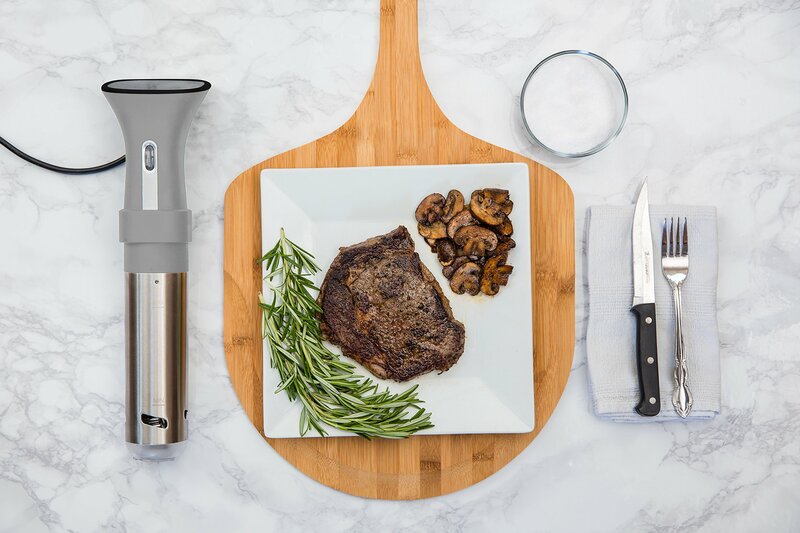 With sous vide, there is no worry of overcooking. 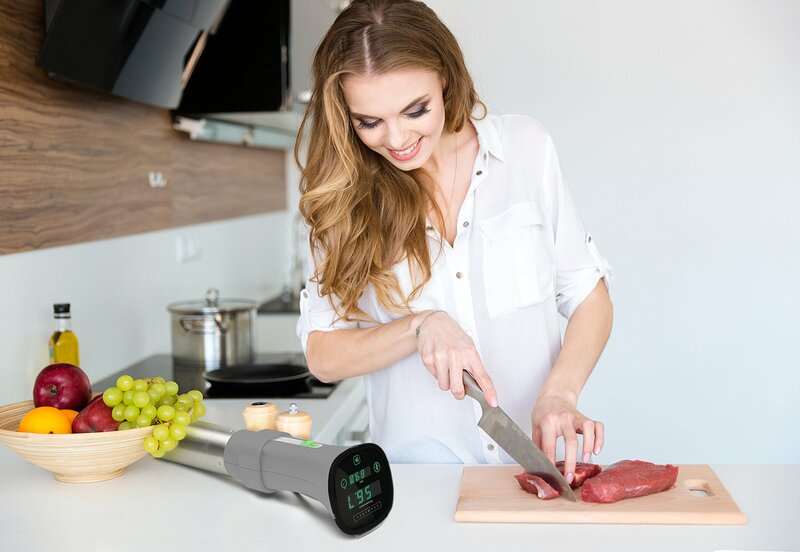 Our device raises your meal to the exact temp you want to cook it to. Uniform results – edge to edge. COOK ALMOST EVERYTHING You don’t just eat meat for meal time. So, our device doesn’t just cook meat either. You can make delicious veggies, dessert, eggs… even soup, condiments… We know you’re concerned with health, too. 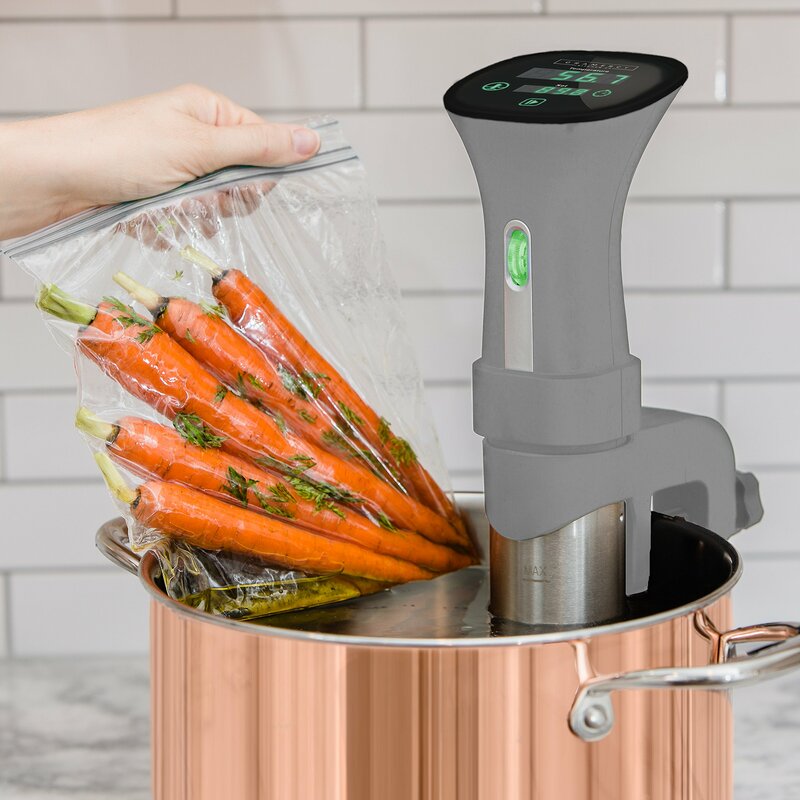 With sous vide, all the good-for-you stuff is trapped in the bag, and in your food. NO NEED TO BE A TECH EXPERT Have you ever bought a device only to realize you need tech support to make a house call before the thing will work? Some sous vide devices only work with buggy technology. 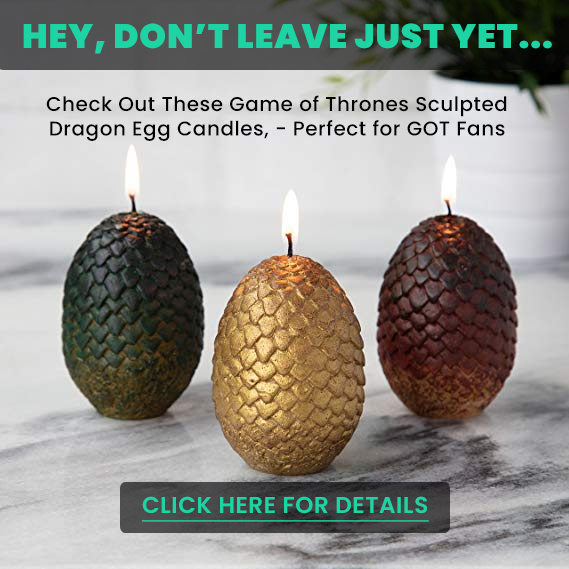 Because ours doesn’t use Bluetooth or Wifi connectivity, no downloading anything fancy. No fighting with the internet. It works intuitively straight out of the box. *note: not associated with Anova Culinary or Nano. Accurate within +/- 0.1°C between 40-90° C/104-194° F. Did we mention it’s whisper quiet, too? ‍ WHY WE DO WHAT WE DO: We love to cook. We use our products daily and we only use the best. We provide the exact same for our customers. Because of our commitment to quality, we offer a machine that will last. We built in a special shield that keeps steam from creeping into the electronics of your unit, damaging it. Your machine will last. Also, our cooker uses the perfect amount of power to quickly heat your water bath. No using extra electricity as with others. Operates in near silence. 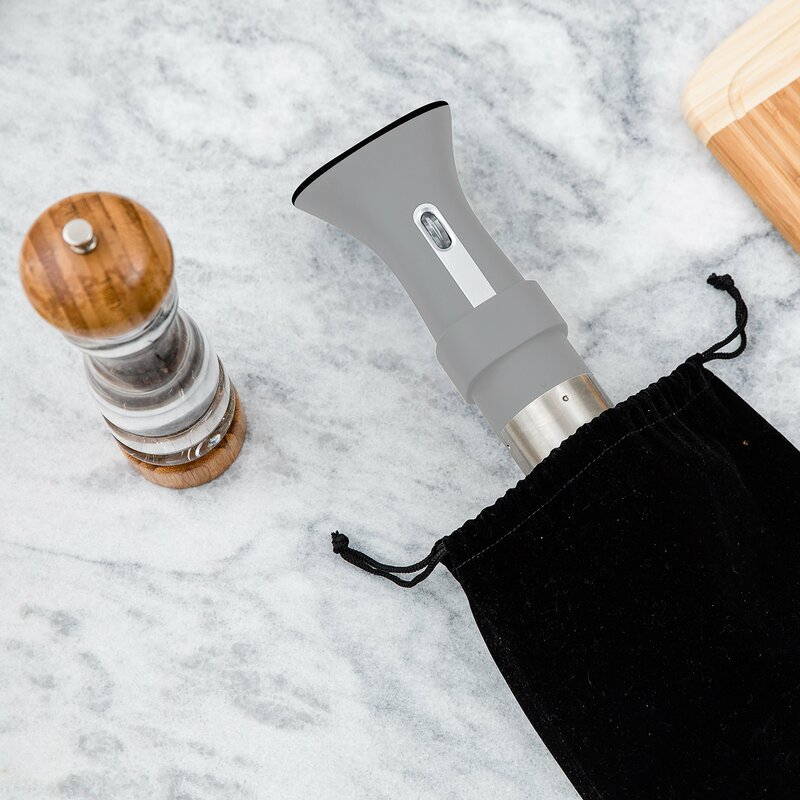 ‍ HANDS FREE COOKING: Our sous vide stick shortens your active meal prep time. 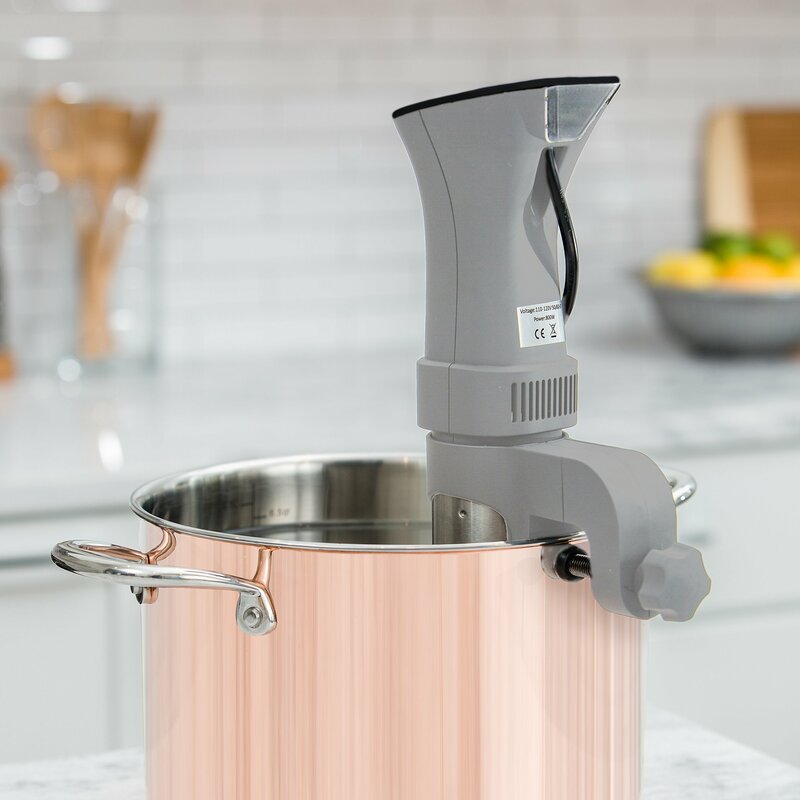 It takes 10 minutes to season, bag up or vacuum seal your food and prepare your sous vide container, lid, water balls and rack if you have them – your own at-home water oven. Then, let it run. No need to babysit the process, freeing up your time to relax. Then, get ready to serve the best steak, eggs, chicken you’ve had. Easy to clean! Just twist off the pump housing, use a little dish soap and lay flat to dry.